I love LoVe LOVE breakfast! I’m currently playing The Game-On Health Challenge (come join the next round! ), and I chose a gluten-free meal plan. 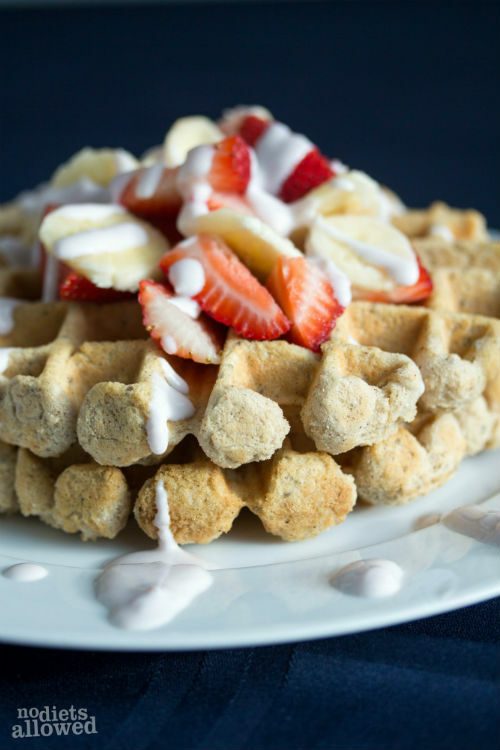 Since many of my favorite breakfast recipes have whole wheat flour such as my beloved Multigrain Waffles, I’ve been experimenting with all purpose gluten-free flour. I was skeptical the they would turn out as great as my other waffle recipes… but they were tasty, fluffy, and a complete success. So… I can’t get enough of coconut. Whether it’s coconut oil, milk, or flour, I’m loving all the health benefits and flavor. My husband now loves spreading coconut oil on top of waffles and bread instead of butter. Just another way to sneak in some healthy stuff just like I did with my homemade whole wheat bread. 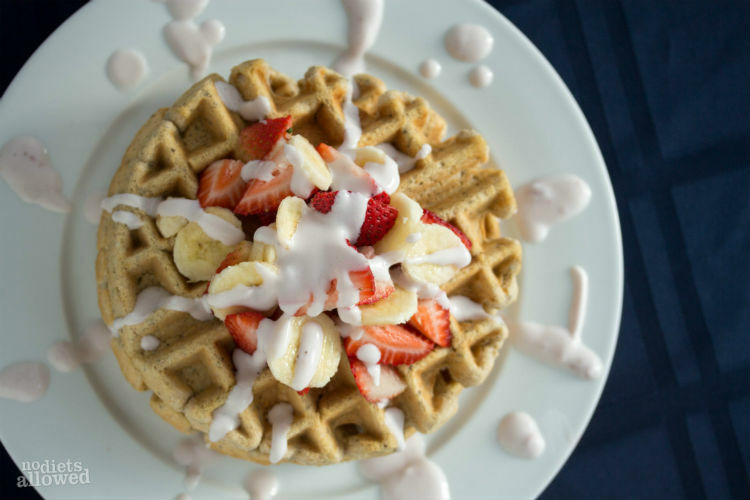 Well, you’ll get double the benefits with this gluten-free waffle recipe. Of course I want you to slather lots of coconut oil on top, but the real coconut benefit is on the inside. Coconut flour, which is super high in fiber, is a great gluten-free option. It absorbs lots of liquid so you don’t need much and tastes great. Can’t wait for you to try it! Here are the other ingredients I used for this recipe. Combine all dry ingredients (first 7 ingredients) together well in medium-sized bowl. Combine well. Combine eggs, oil, and milk. Add them to the dry ingredients and mix well. Pre-heat waffle iron. Lightly grease waffle iron with olive oil cooking spray. Pour about 1/2 cup batter in center and bake to preference. 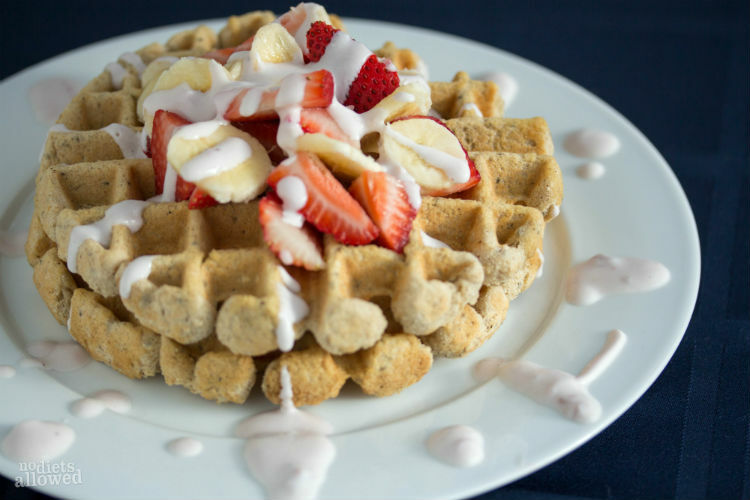 TOPPING SUGGESTIONS: Fresh sliced fruit, pureed raspberries or strawberries, or peanut butter and banana slices. 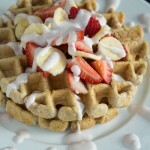 Do you need other scrumptious gluten-free breakfast recipes? Try my Breakfast Quiches and my Pumpkin Gluten-free and Vegan Muffins. I just bought gluten-free flour to make some cupcakes, I will for sure have leftovers – I can try this! Pinning! Gluten-free cupcakes? I can’t wait to try them out, Yvonne! My little girl is a waffle addict! We need some great recipes to change things up – pinned! Right back at you, Bonnie! I can’t get enough of your site. I love waffles too! I have another recipe that isn’t gluten-free that I’m obsessed with also. Yay! My cousin’s wife is gluten and dairy intolerant so when they come visit I have a mini panic attack about feeding her! I usually go to the grocery store and buy a ton of fancy ($$$) prepackaged stuff but I love to cook REAL food so this will be perfect! Thanks, Briton! Gluten and dairy sensitivity is becoming more and more common, BUT it shouldn’t mean we have to compromise on eating yummy food. Oh these look really good – I have been considering trying Gluten Free for my husband. We will have to try out this recipe! Thanks, Summer! I was skeptical about gluten-free flour, but they turned out really light and fluffy.